Home / Travel / Tourism/ Cinnamon TBC Asia 2018 inviting international bloggers with world-wide followership! Cinnamon TBC Asia 2018 inviting international bloggers with world-wide followership! The third edition of the bi-annual event, Cinnamon TBC Asia 2018, will host an impressive group of 60 international bloggers who has garnered a worldwide followership on their international platforms. The emphasis is on the ability to speak one on one with these international bloggers, a unique opportunity made possible to all participant to the conference to be held at Cinnamon Grand Colombo on 30 October. While the conference will be conducted under the theme ‘Agents of Change – Creating Transformational Digital Content for Travel with eight world renowned speakers addressing the theme under varied topics, the event will recognised and highlight the international populace garnered by the collective of highly influential international bloggers attending Cinnamon TBC Asia this October. Cinnamon TBC Asia 2018 Awards ceremony will celebrate these influential and trailblazing bloggers in an array of fields and scopes. Comprising ten key categories including Adventure, Culture, Photography and Food, the awards program will recognise online bloggers and influencers whose works have had transformational impact on various facets of the global travel industry. The 60 travel influencers and digital marketing experts participating in the forum comes with some amazing numbers in terms of followership, readership, viewership and likes. Having mastered the intricate art of creating unique and influential travel content for varied digital platforms, the bloggers have attracted an international audience of enthused travellers and travel industry representatives from UK, Australia, Philippines, India, USA, China, Poland, Germany, Italy, Ireland, UAE, Singapore, Canada, France and rest of the world over. 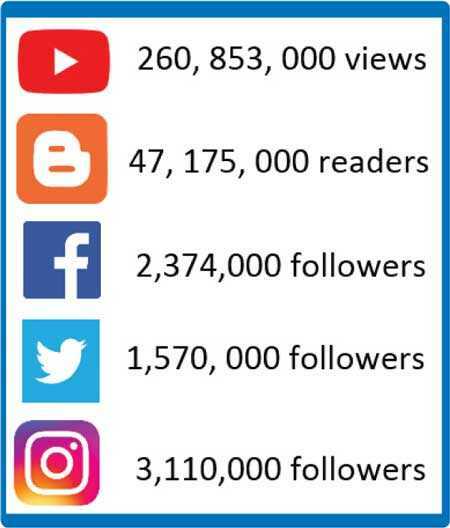 Combine numbers of all the international bloggers participating Cinnamon TBC Asia 2018 roughly rounds to the following impressive statistics: Visit www.cinnamonboffice.com or www.tbcasia.com to purchase tickets for Cinnamon TBC Asia 2018 to be held at Cinnamon Grand Colombo on 30 October. For more details and inquiries, please contact 071 711 8111. The Cinnamon Travel Blogger Conference 2018 is supported by PTBA (Professional Travel Blogger Association) and PATA (Pacific Asia Travel Association), Official Airline partner – Sri Lankan Airlines, In association with Leveza by MAS, Telecommunications partner – Mobitel, Destination partner – Sri Lanka Tourism Promotions Bureau, Hospitality partner – Cinnamon Hotels & Resorts, Official Digital Partner – eMarketingEye, Print Media Partner Ceylon Today and Radio Partner – Real radio and Kiss FM.